The purpose of the project was the digitization of the TAP publications and the development of an appropriate IT infrastructure for their management and disposal. Contractor of the project was Modus S.A. for which our company was a subcontractor. Electronical distribution of the “Archaeological Bulletin” (Chronicles, Studies, Analects from Athens). Electronical distribution of photos included in the “Archaeological Bulletin” and TAP’s photographic archive. 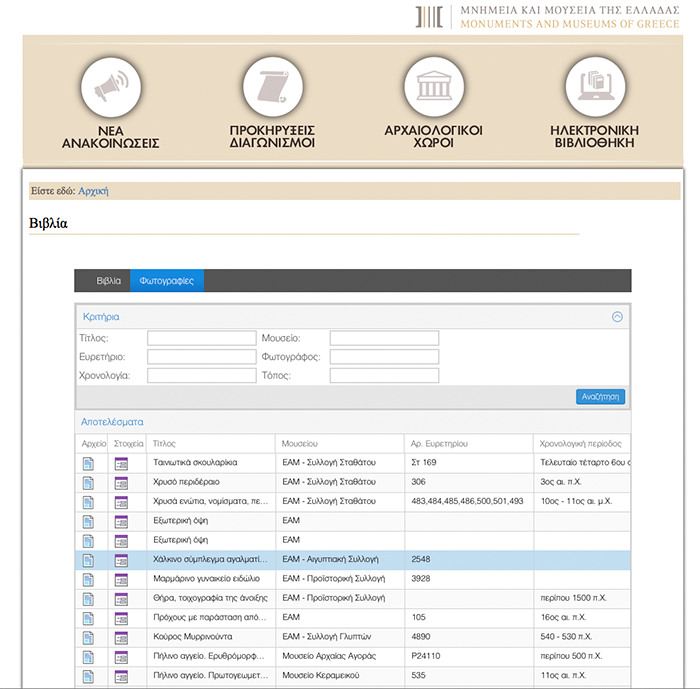 Updated web service for TAP’s publishing material. Electronic orders submission for printed TAP’s editions and e-payments for them. Approximately 110,000 pages of 3,000 articles. 10,000 transparencies of various sizes from the TAP’s photo archive. These resources were documented with metadata in Dublin Core format. Moreover, the digital output of the books (most of it in greek polytonic system) underwent through OCR process and the resulting text was corrected by philologists specialized in historic documents. Scanned photos were edited and color corrected by a specialized team of photographers.